The Brooklyn Arts Council, then known officially as the Brooklyn Arts and Cultural Association (BACA) funded our appearance on the Parkway in 1990. We could have provided our services gratis, but the big groups had sponsors. Why shouldn’t we? The grant, taken from public funds, covered rental of a truck with a small flatbed, props, decoration of the truck, and compensation for core Troupe artists. Frisner assembled musicians Jean Alphonse, Steve Deats, Paul Newman, Luc Richard (all drummers), and Alberto Plummer (trumpet); dancers Nicole Attaway, Carole Jean Louis, and Jocelyne Louis; and several friends and students. Frisner worked with a friend to paint the large wooden sign crediting our sponsor. (It was not lost on our Haitian friends that the acronym BACA, pronounced with a hard “C,” is baka in Kreyòl: a little demon.) He embellished the words in the front with the cover of his 1986 album Èzili and a cutout photo of himself with a trophy from the back of his 1982 album A Trip to Vodou. The back of the sign bore images of various Vodou spirits. The hood of the cab carried a drapo, one of Haiti’s sequin arts, this one flashing a symbol of the spirit of love. Props also included a flag sporting more symbols of the spirits on a base that resembled the Haitian national flag. 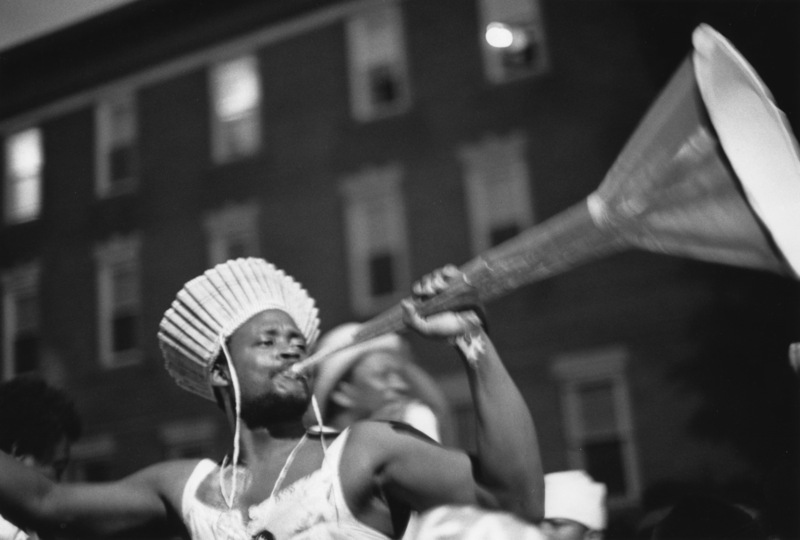 We made sure that Haitians who lined the Parkway—treated mainly in 1990 to calypso and soca from Trinidad and maybe a spot of Haitian konpa–got a nice Afro-Haitian bouyon rasin (roots stew). In case you’re wondering, the maestro’s costume was a yellow cotton print dress he’d bought for me in a Miami flea market. 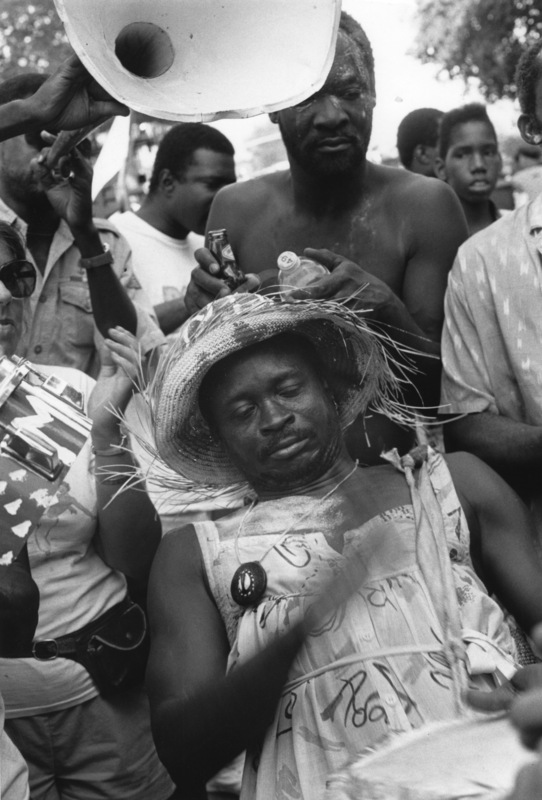 We set out from our home base on Rutland Road in East Flatbush and zigzagged through the streets toward the Parkway, and from that point our cortege blossomed. In all, I captured two hours of video, and friend and photographer Chantal Regnault countless photos. We had moved a mere eight blocks along the Parkway when the police directed us down Rogers Avenue. The party was over. But we’d had ample time get our audience hip-grinding to such Carnival classics as “O Seigneur.” That’s what gouyad means, by the way, a fun and seductive hip grind. Watch Frisner’s rooftop gouyad (below) and try it. Isn’t the history of Eastern Parkway rich? And Makandal with Master Drummer Frisner Augustin was part of it. The magic of audio, video, and photography has taken this experience beyond memory. Documents like the ones on this page have the potential to educate and delight for generations down the line. Learn about Makandal’s Frisner Augustin Memorial Archive, and please contribute. Mèsi anpil! Thank you!